Subscribe to our monthly email newsletter to receive special offers, new titles, etc! If you are looking for the consumer DVD, please Click Here. As autism has exploded into the public consciousness over the last 20 years, two opposing questions have been asked about the condition fueling the debate: is it a devastating sickness to be cured or is it a variation of the human brain – just a different way to be human? 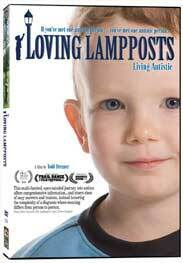 LOVING LAMPPOSTS: LIVING AUTISTIC takes a look at two movements: the "recovery movement," which views autism as a tragic epidemic brought on by environmental toxins and the "neurodiversity movement," which argues that autism should be accepted and that autistic people should be supported. After his son's diagnosis, filmmaker Todd Drezner, visits the front lines of the autism wars to learn more about the debate and provide information about a condition that is still difficult to comprehend. This film is a great learning tool. Cinema Libre Store © 2017 All Rights Reserved.